Martin O'Meara is Australia's only Irish-born recipient of the Victoria Cross. That cross is coming to the National Museum of Ireland. Ian Loftus, author of a book about Martin, told Ryan about this tragic and heroic figure. Hassan and Hussen Benhaffaf were born conjoined in 2009, before being successfully separated the following year. 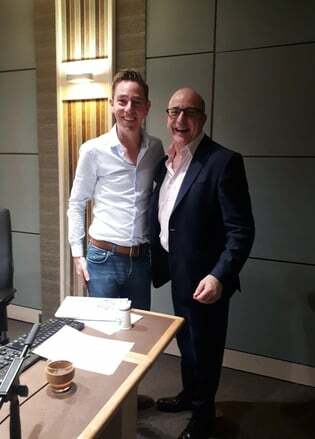 They still have regular hospital visits and procedures and to cheer them along, their ice-cream man Míceál O'Hurley asked a certain Tom Hanks to record them a message - which he did! You can watch the video here. The stories and headlines of the day that grabbed Ryan's attention. Irish author John has come under fire for a message that he tweeted last week, along with comments in an article he wrote. As a result, he has left social media. He spoke to Ryan about the incident and the fall-out. Hot on the heels of the Clooneys, Michael Caines is coming to Ballyfin Demesne in Laois this week - for an evening of, 'Exceptional gastronomy and hospitality.' He spoke to Maggie about his life, his career - and the fact that he only has one arm, which clearly doesn't hold him back. Sri Lanka has been rocked by eight explosions in various churches and hotels. Hundreds of people have died and many more injured. Tom Wall, Irish ex-pat living in Sri Lanka and friend of the show, spoke to Maggie about the atmosphere over there at the moment. The stories and headlines of the day that grabbed Maggie's attention. Pete has a message for dog-owners; do not give your dog chocolate, or leave it out somewhere they can steal it! The chemicals that make us love chocolate are what make it toxic for our canine companions, so keep an eye on your dog this Easter. Actor and theatre-maker Emma spoke to Maggie about her grandfather's life, which largely remained a mystery until she found tapes that he had recorded. She has now written a play based on those recordings. 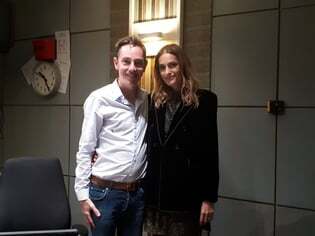 This week Ryan spoke to Jane Ryan about how a devastating job loss turned into an unexpectedly fortuituous turn of events, Rachael Keogh about overcoming her heroin addiction, and John Byrne about leaving the gardaí and becoming a wildlife conservationist! Former Garda John A. Byrne is used to dealing with rule-breakers - but it's very hard to control baboons and elephants! He came in to talk to Ryan about his career change. 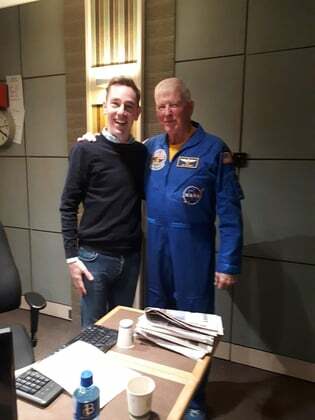 If you want to volunteer with either of John's organisations (http://www.galanaconservancy.com/ or https://www.friendsfromireland.ie/), email johnab@eircom.net. Kate Mulhern has a brown belt in karate, and competed in the world championships in Tenerife; but she never thought she'd have to use her skills to protect herself and her puppy while out walking in the middle of the day. She told Ryan her story. Rachael Keogh is a survivor - and she has the physical, psychological and emotional scars to prove it. Addicted to heroin by the age of 13, she went through many horrific years, causing huge turmoil and distress to her and those around her, before she managed to turn things around - and is a healthy, contented woman today. She told Ryan her story. Country music stars Margo and Nathan Carter joined Ryan this morning to discuss their role in The Late Late Shows search for a new country music star. Westmeath GAA star Boidu Sayeh and his adopted mom Therese Kinahen told Ryan about their journey from leaving worn torn Liberia and relocating to Westmeath. Therese had been working as a missionary in Monrovia and when Boidu's mother sadly passed away made the decision to bring Boidu back to Ireland and join her family in Westmeath. Ryan took to the streets of Mullingar to meet and chat to some of the locals who came along to the this mornings outside broadcast in the town centre. Author Jane Ryan spoke to Ryan about her debut novel '47 Seconds' and how she made the change from a career in IT to that of an author. Ryan spoke at length about the new idea of fake tan becoming a sign that you're not engaging enough with people, and listener Mandy got in touch to talk about Vietnamese girls doing the opposite and bleaching their skin! This week Ryan spoke to Kate Veale about aiming for the Olympics - twice, with a huge dip in between; Brian Brennan about setting up orphanages in Sri Lanka; Newbridge House tourguide Cathal and vet Peadar about their idyllic workplace; And Elizabeth Oakes about beautifying dead people. Elizabeth Oakes is a make-up artist - for the dead. A mortician and permanent make-up technician, she has had clients of every kind, and at most stages of life, and beyond. She's championing eco-cremation, and came on to chat to Ryan. Tour guide Cathal Dowd Smith and farm vet Peadar O'Scanaill have one of the most beautiful offices in the country - they chatted with Ryan about day-to-day life in the beautiful surroundings of Newbridge House and Farm. Mary Pat Kelly joined Ryan to talk about her new novel, 'Irish Above All,' her Irish roots, and her connections to the Kennedy clan. Live from Newbridge House! News Round-Up of the Day. To help celebrate the launch of Newbridge House and Farm's new Farmyard Discovery Trail, we broadcast from Dublin's, 'Best-kept secret;' maybe not a secret for much longer! RTE's series, 'Raised by the Village,' is looking for new participants - and who better than to advertise the programme than Leah, one of the former participants who is a glowing advocate of the transformational process she underwent when she appeared on it. Brian Brennan had it all, lost it all...and then decided to give it all. A successful hotel manager until the boom, the crash wiped out his business, so he went to Sri Lanka to make money, and discovered a passion in his that he didn't know existed. He told Ryan about his experience and his charitable endeavours. Kate Veale has experienced extreme highs and extreme lows in her life, but has come through them all to reach more of an even keel. She's currently training in a bid to compete in the next Olympics, and came in to tell Ryan about what she's been through and how it's brought her to where she is today. On the back of our thoroughly enjoyable trip to beautiful Derry this week, Tourism Northern Ireland gave us a weekend away to Derry for one lucky listener, staying in the Bishop's Gate Hotel. We were inundated with entries, but there could be only one winner! Foróige - the future is bright! This week Ryan spoke to human cyborg Denis Canty; tour-guide Gleann Doherty who shows people around Derry; author Elizabeth on failing and surviving it; Mark Boyle about living without electricity and Ava Power about, 'Foróige,' and cyberbullying. Email about abusive relationship - in family business! A listener emailed in about their strained relationship at work - with their own father. Ryan read out the email in the hope of highlighting this person's plight and showing other listeners that there is hope. Mark Boyle lives life by his own rules - which include no technology, no 'running water and no electricity! He went, 'Off-grid,' almost three years ago, and has documented his experience in new book, 'The Way Home; Tales from a Life without Technology.' He came into studio to talk to Ryan about it. Upon Ryan's mention of the passing away of George Klein, a d.j. and great friend of Elvis', Barry Callaghan got in touch to reminisce about living above the Sallynoggin Inn, where Frank Chisum - Ireland's answer to Elvis - used to perform regularly. On the back of her popular podcast, 'How to Fail,' journalist and author Elizabeth Day has written a book based on the same topic. Ryan spoke to Elizabeth about modern society, how we're scared to fail, and how it's actually a good thing if we embrace it.